his recipe may look like a lot of work but it comes together quickly. Make the salsa first so the flavors have time to build. Then prepare the rice and put on the stove. After that, cook the shrimp and before you know it, you will be serving a colorful spring meal. In a medium bowl, toss mangos through kosher salt together, cover and place in the refrigerator. In a pot over medium heat combine butter through all spice. Bring to a simmer, add brown rice, cover and cook 45 minutes. Cook rice in coconut milk, cumin powder, garlic, yellow onion, and salt. Once cooked, stir in black beans, lime juice and cilantro. Stir together salt, and peppers. Sprinkle over shrimp. Cook shrimp in a skillet over medium low heat, cooking about 2 minutes per side, or until they turn pink. 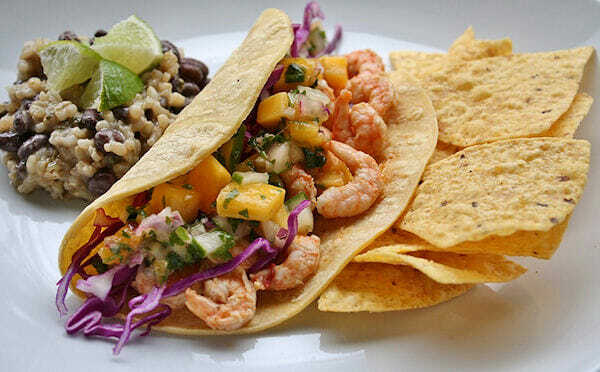 Divide shrimp into four portions, and divide each portion over two corn tortillas. Top with mango salsa and serve with coconut rice.